One things for sure, they`re all accurate relative to each other, which is what matters ! Just how much gain do you get from a 10 element Contract aerial ? These were relatively good quality Contracts (they had baluns) and it cannot be overstressed that some Contract aerials` performance can be very inconsistent, and this is particularly the case outside of their designed for group, see below. Note that the A group curve is that for post 1995 aerials, when the A group was extended up to CH 37 from CH 34, see below. 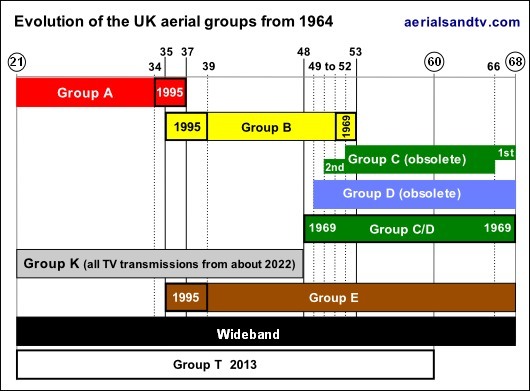 Thus the response curve for aerials fitted prior to this date would be about three channels down. 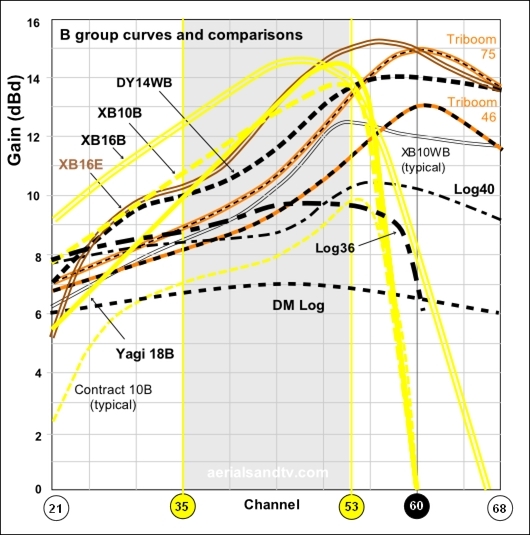 Also see B group Contract aerial curves, and how the aerial groups evolved. Notes : The dates of 1969 and 1995 (for the changes in the groups) are approximate. 1969 was the year that BBC1 and ITV joined BBC2 in being transmitted on UHF. Channel 5 began transmission on the 30th of March 1997, but planning for this had started years before this. A helpful contact in the aerial industry has informed me that the extending of the aerial groups was being undertaken 18 months to two years before the actual launch of C5, giving 1995. However aerials designed under the previous group designations would probably still have been on sale/being fitted months (or even years) after 1995. Most important of all, grouped aerials frequency responses are approximate, very approximate ! For instance, an E group is really a wideband with an emphasis on the top end frequencies. The K group needs clarification as well, particularly post switchover when there are a significant number of K group transmitters. The K may technically finish at CH48 but every K group I`ve ever tested actually works fine up to CH53 or beyond, thus the K group actually includes quite a few transmitters, e.g. Sandy whose top channel is on CH52. 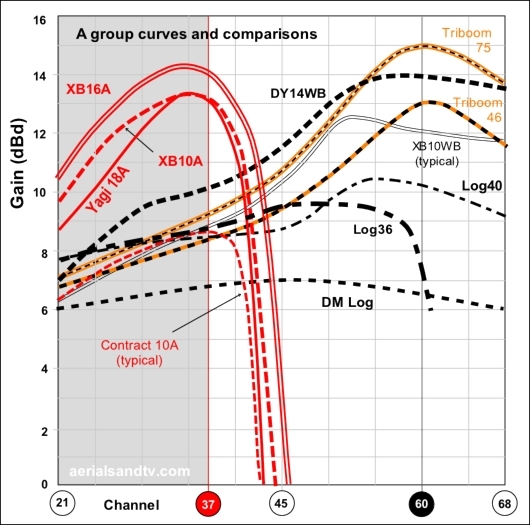 After the 700MHz clearance (due 2017 to 2020) the TV band will be K group ! Well more or less, because the esoteric HD MUXES (7 and 8) will be transmitted on CHs 55 and 56, so for those who want those channels a wideband (or Yagi18K which works higher up the band than other K groups) would be required. MUXES 7 & 8 are due to be switched off sometime after 2022 though. I know I have and I don`t think I`m autistic. My wife reckons all men have autistic tendencies and I think she could be right. The question is, can you actually be autistic if you take the mickey out of yourself for being autistic ? When UHF transmissions first started in 1964 the C group was CH52 to CH68 though it was later changed to CH50 to 66. However an additional D group (blue bung) was also added which was CH49 to CH68. I can`t imagine there`d be much difference between aerials of those three groups but there we go. 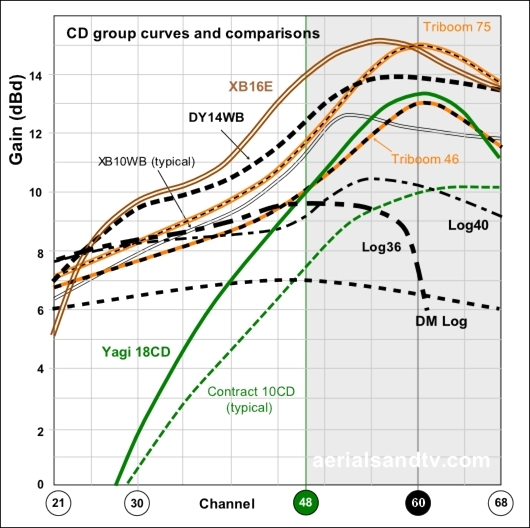 Finally in 1969 the C and D groups were amalgamated into one, the C/D group at CH48 to CH68. Testing decent quality aerials is all very well, but what about the cheapies that many people may already have up, or be put up by a tight arse aerial installer ? Above we have two Contract 10Bs, an old Contract 18B (possibly 20 to 30 years old ? ), two Contract 18Bs, plus the Yagi18B and the XB16B which we sell. I was particularly interested to find out how much difference a balun made to the performance of an aerial and in the above tests the two Contract 10s are identical save for one having a balun and the other not. From those curves, and the others come to that, it can be seen that a balun does seem to have an effect on gain, particularly outside the aerials designed for band. It will be noted that the gain of the old Contract 18B was dipping way before even CH53, which is the top of the B group. As can be seen below the B group used to finish at CH51, but even so, the aerial is dropping off too early. 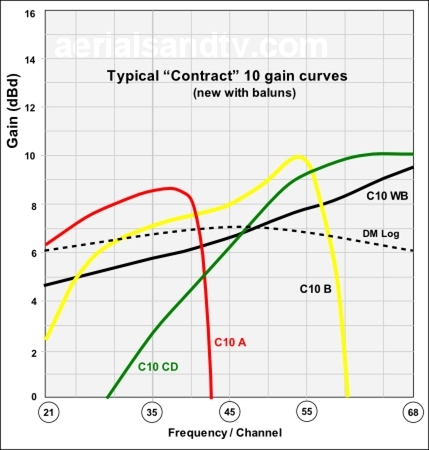 Now, all aerial gain curves have bumps and dips in them, so on this site (and in fact all published aerial gain curves....) they are smoothed off for clarity, but the huge dip in the gain of the Contract 18B without a balun is of a different order altogether. This is typical of some Contract type aerials, beware. The B group, and the E group, were also extended down to CH35 (from CH39) around 1995 when the planning for C5 transmissions (from 1997) was beginning. At this same time group A was extended up from CH34 to CH37 because some group A transmitters (Crystal Palace being the most obvious example) were having to transmit C5 on CH37, though somewhat confusingly, in the case of Crystal Palace, it was actually transmitted from Croydon ! 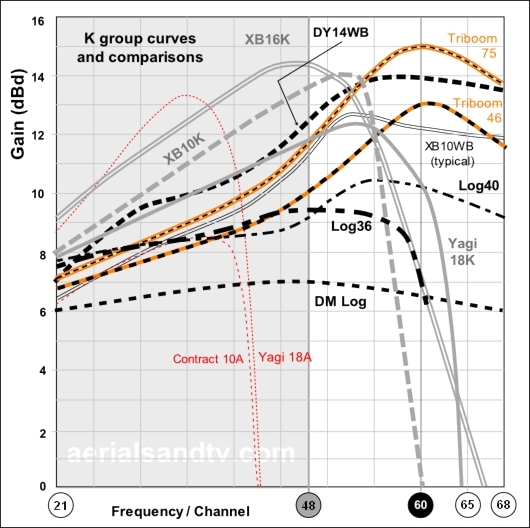 It must be said that extending aerial groups down a few channels is usually a bit irrelevant because Yagi antennas generally work pretty well below their designed for bands, although, (as explained above) Contract type aerials [and some others without Baluns ? ] don`t always work quite as well as decent antennas. Addition of the T group : The latest (but quite possibly not the last) change to the aerial groups is the addition of the T group in 2013. This is effectively a truncated wideband which is a first in that up to now, in our little history lesson, all has been about extending not truncating ! Anyway, this pruning of the wideband is to allow for the fact that from July 2013 onwards there are no TV transmissions over CH60. That part of the spectrum having been sold off for 4G mobile phone use. Now those transmissions may well cause problems with TV reception so it`s actually preferable to have an aerial which doesn`t pick up over CH60. Isn`t it funny how the old ways (in this case aerial groups, specifically A, B & K) are often found to be the best in the end ! 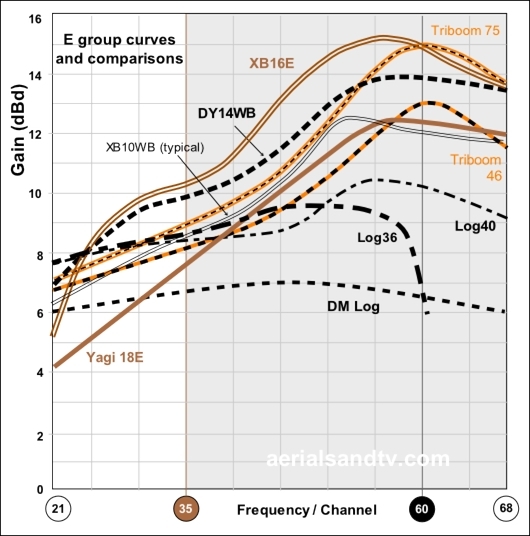 However : If you`re on a wideband transmitter and really do need a high gain aerial (most people don`t) we still recommend a high gain wideband over a T group despite the fact widebands are technically obsolete. 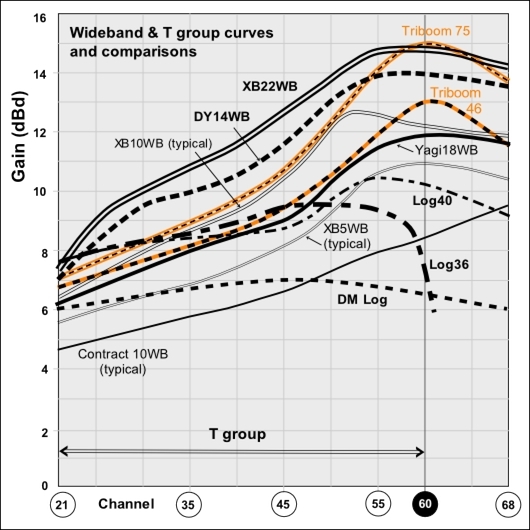 This is because all T groups start dropping of in their gain curves in the mid high (channel) 50s to try and minimise 4G interference, though I`m sceptical if they do much good at it….. But if you`re in a poor spot you need high gain there ! So I`d go for a high gain wideband and in if you do have 4G problems get a filter which will work better at preventing 4G interference anyway. This is particularly the case when the filters are free from at800 ! ! There are rumours that in the future TV transmissions may eventually be restricted even further, possibly into just the A group. Cynics like me even wonder if all TV transmission in the UK will end up in the “CH31-37 gap” ! Fortunately all (decent) grouped aerials still work down at CH21 (apart from C/Ds) so, to be frank, I wouldn`t worry about these potential changes too much. As the TV frequencies are moved down the band (more accurately compressed down the band…. ), it should be remembered that signals of lower frequency travel more efficiently than those of higher frequency. This can mean that signals of borderline quality before, can become more reliable, particularly if they all fall within the A group, provided, of course, you`re using an aerial tuned to pick them up efficiently, i.e. an A group !